Well, I have to admit to not following my own to-do list when it comes to this one. 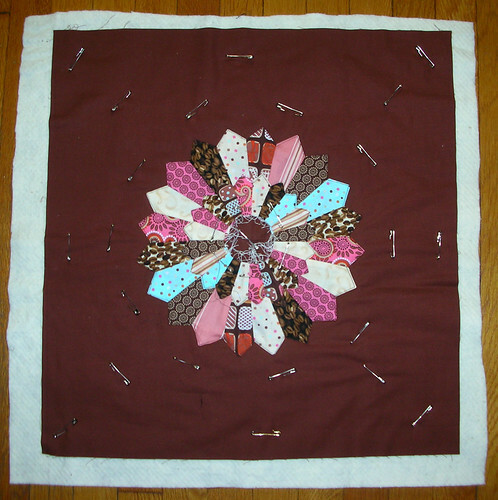 I decided that I wanted to machine-quilt on the Dresden medallions, and that tumblers on the back would detract from the effect of the quilting. So instead I pieced together two pieces of dark brown, to provide a little bit of contrast from the more chocolatey brown of the front, and machine-appliqued the two medallions on. Isn’t the concentric pattern pretty? Then I finished piecing and ironing the fans for the corners, and attached them, again by machine applique. I’m definitely doing all pointed medallions for my larger quilt, because folding the edges under by 1/4″ on the fans was a huge pain. Now I need to decide what to do for the center of the circle and the centers of the fans. I may fussy-cut a teacup print for the center of the main circle, and then use quarter-circles of pale blue or dark brown for the corners. I think probably brown: I don’t want something as eye-catching as the blue for the corners, because it would draw attention outwards, when I want all attention on the medallions! I think that since this is a mini-quilt, probably destined to live on someone’s wall (I’m planning on putting in little hanging-friendly corners when I bind it), that appliqueing the medallions and their centers down should be enough quilting to make it sturdy enough: I can’t think of any way to quilt the border areas without detracting from the clean lines it has right now. I’m tempted to try to quilt a zig-zag line that mirrors the Dresden’s spokes, but I don’t think I could pull it off successfully. Then I just have to make my mind up about binding! It’s looking great! 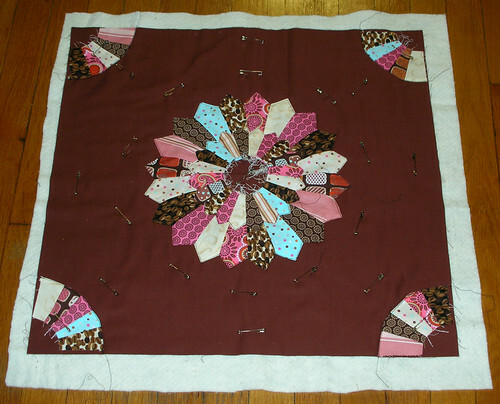 Pretty looking dresden medallion and your machine appliqueing turned out beautifully – both front and back. 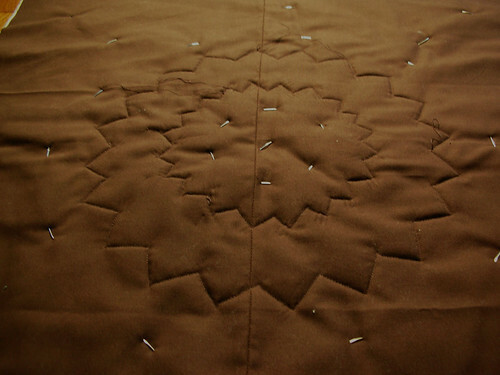 Look forward to seeing the finished wall hanging. It looks great! The back reminds me of chocolate, LOL. Must be one of those days. Popping over from Plum and June…love the dresdens. They are one of my favorite traditional blocks. Thanks formsharing. I love the mini-dresdens and the way you put the fans in the corner here, it’s really cute. I’ve been secretly pining to do some dresdens myself but haven’t quite plucked up the courage or fabric to yet. I like your idea of fussy-cut centres or another alternative might be a small matching print in two different colour ways? Looking forward to your next installment on this project. Next Next post: Reorganization = De-stashing!